No One Should Rule Out a Trump Reelection in 2020As in 2016, Trump’s most important asset in 2020 could be a surprisingly vulnerable Democratic opponent. Gary Johnson Criticizes Trump for His Inappropriate Behavior Toward ‘Mowmen’Gary, spell-check! Gary Johnson Declines to Name Leader of North KoreaHe’s through with foreign-policy pop quizzes from the media. 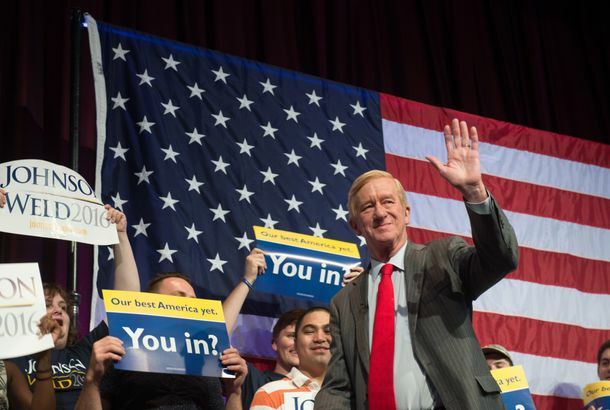 Libertarian VP Candidate Gives Up, Will Focus on Preventing Trump PresidencyHe claims he still supports running mate Gary Johnson, but he’s essentially working to elect Hillary Clinton. Gary Johnson Can’t Name Single World Leader in Self-Described ‘Aleppo Moment’Smart idea: Cover by reminding everyone of your last terrible gaffe. Maybe Millennials Think Clinton’s Already Won. She Hasn’t.The good news for Clinton is that if Millennials figure out she’s in trouble, they will be much less likely to stay home or defect to a minor party. What’s Gary Johnson Doing With His Tongue?We are all Kasie Hunt. 5th-Party Candidate Calls 3rd-Party Candidate ‘Not Serious’Even in the sideshow of minor-party politics, Gary Johnson and his Libertarians are a lot more “serious” than Evan McMullin’s #NeverTrumpers. Romney Wants Gary Johnson in the Debates, But Not Enough to Help Him Get ThereHe still won’t endorse the Libertarian ticket. Minor-Party Candidates Unlikely to Have Major Effect on the Presidential RaceSupporters of Johnson and Stein are less likely to vote, and mostly would split between the major-party candidates if forced to choose. Libertarian Candidate Tries to Get Mitt Romney to ‘Feel the Johnson’Libertarian Party nominee Gary Johnson tells CNN that he’s in discussion with the 2012 GOP standard-bearer over a possible endorsement. New Poll Shows Clinton With Double-Digit Lead Over Trump and JohnsonThere’s fresh evidence of Clinton regaining her earlier robust lead over Trump, this time with Libertarian Gary Johnson in the mix. Johnson to Seek Libertarian Party Nomination He will make the announcement on December 28 in Santa Fe. How Buddy Roemer and Gary Johnson Spent Last Night’s DebateExactly as you’d expect. Gary Johnson Joke Even Less Original Than Initially RealizedIt’s been floating around for about two years now. Fox News Will Let Gary Johnson DebateJohnson is usually ignored. Guy Who Backs Abortion, Pot Legalization, and Gay Rights Running for GOP NominationFormer New Mexico governor Gary Johnson announced that he’s running for president.